If you're not familiar with Australia's Pegazus, I'll give you some clues to their musical style. Songs include Metal Messiah, Old Skool Metal Dayz, We Live to Rock, and a cover of Judas Priest's Metal Gods, and the album title is In Metal We Trust. Yeah, this is classic heavy metal circa 1983. Pegazus has been in the game since 1993 bearing the banner of classic and melodic heavy metal. They've had great success and representation through the formidable Nuclear Blast label. However, while they are good at their game, In Metal We Trust is an uneven offering. Metal Messiah and Road Warrior offer the listener true metal. But then Old Skool Metal Dayz, while rocking, is terribly cliche. The extended version, with David Shankle, Ross the Boss, and Jeff Watson takes off some of the hyperbole. We Live to Rock is just that: hard rock; it's a fine song. Haunting Me is classic metal and supreme Pegazus: they excel and persuade with this awesome track. From here things get a little dicey. Though they are all entertaining songs, they don't quite inspire. Eye For An Eye rocks in a metal vein. But Ghost Rider and End of the World take some serious attention to get the full effect. And you can pass on Metal Gods, the Priest cover. Pegazus means well, and you can appreciate their homage, but stick to the original. Death or Glory resurrects the passion that Pegazus has for this great genre; it's everything Manowar should be doing. In the end, Pegazus's In Metal We Trust is a fine rocking, classic and melodic, heavy metal album. I'm a fan; I grew up with this stuff. There are bands that get and do it well. Pegazus is one of the best. Easily recommended. 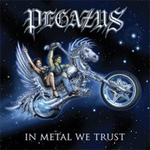 Pegazus's In Metal We Trust is a fine rocking, classic and melodic, heavy metal album. I'm a fan; I grew up with this stuff. There are bands that get and do it well. Pegazus is one of the best.